Martin Klizan endured a miserable first-round exit in the Australian Open, as his marathon five-set defeat by Stan Wawrinka was compounded by him being hit by a ball in the nether regions. 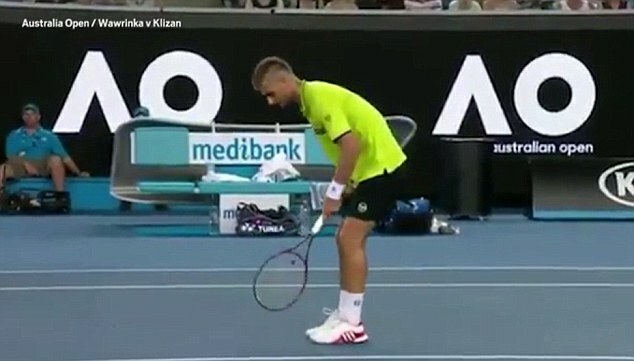 The bizarre incident took place in the deciding set after world No 4 Wawrinka was teed up for an easy smash across court but, having conceded the point, Klizan was hit below the waist by his opponent. 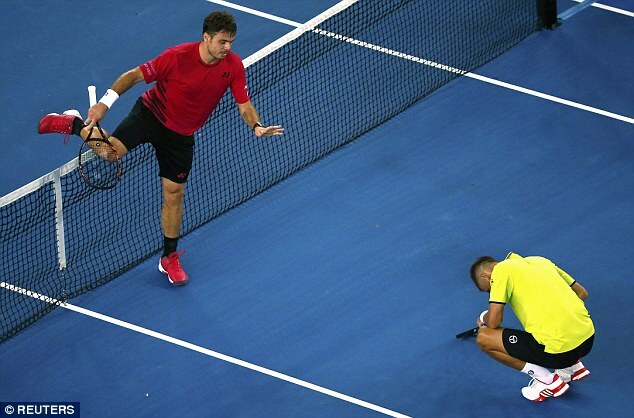 The Slovakian was clearly in pain after the ball struck him in the groin and the world No 34 was far from impressed after expecting Wawrinka to steer the ball over the net with minimum exertion. The Swiss immediately reacted apologetically after realising where his winner had ended up, going over the net to check on his opponent after thumping the ball in his direction. 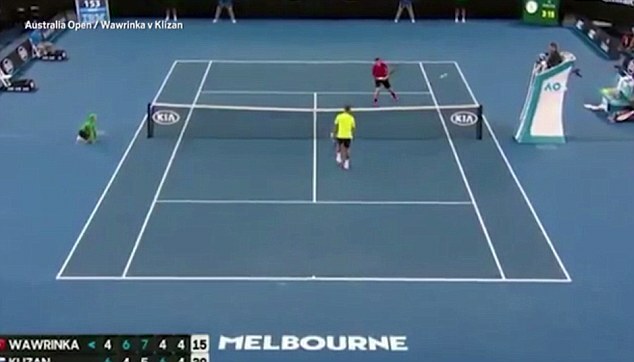 Klizan – who led 30-15 on Wawrinka’s serve with the game locked at 4-4 in the fifth set – appeared to accept his apology but it didn’t prevent the Melbourne crowd from jeering after the unsporting act. Wawrinka regained his composure to take the final set and clinch an epic 4-6 6-4 7-5 4-6 6-4 victory to book his place in the second round. 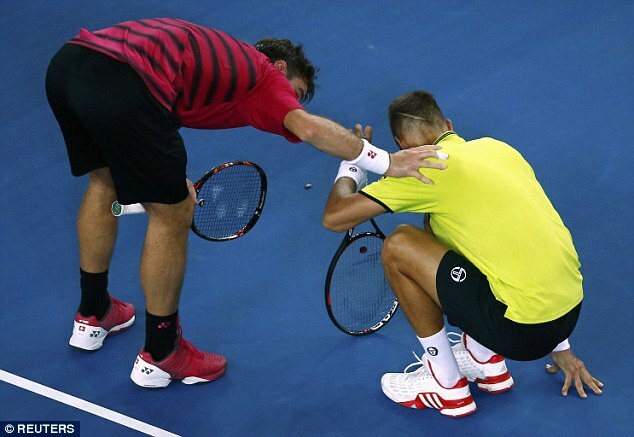 It took Wawrinka more than three hours to subdue his left-handed opponent to cries of ‘Allez Stan’ from the crowd in the Margaret Court arena. For long periods of the match, the Swiss was far from his best with errors flowing from his racket. 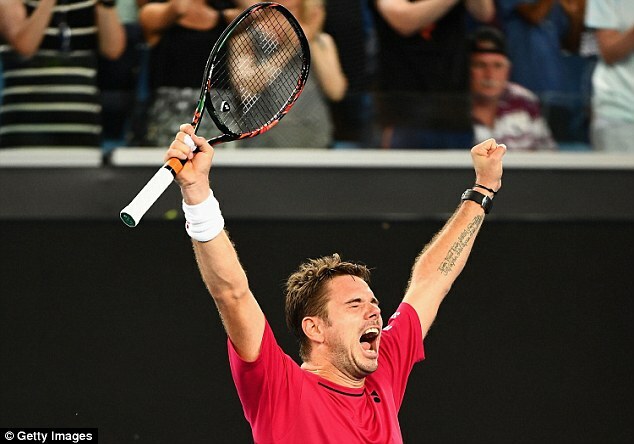 But as a pink dusk descended, Wawrinka slowly found the range on his groundstrokes to move ahead, although the outcome remained in the balance until the final few minutes. 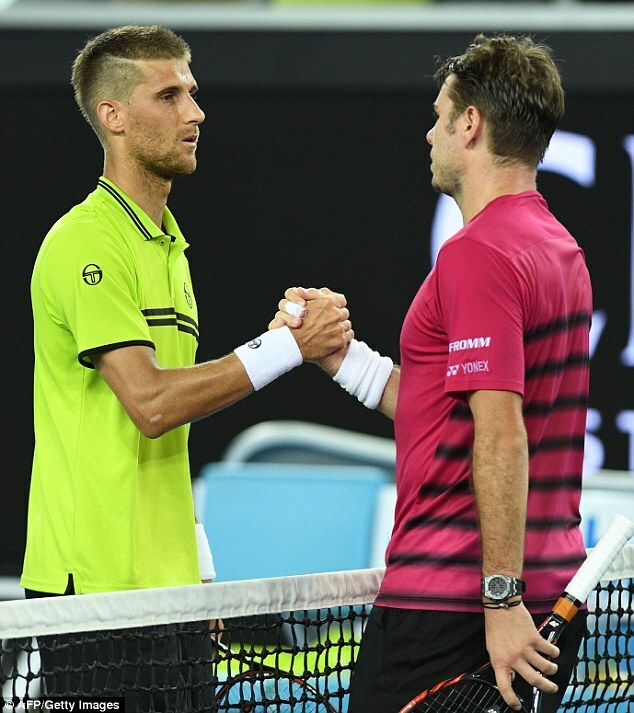 Klizan, who had chances to win the second set, looked favourite when he broke to lead in the decider but Wawrinka doggedly held on and broke from nowhere to make it 4-4 – before the unsavoury incident took place. Serving to stay in the match Klizan had no luck with a challenge at 30-30 – the replay showing Wawrinka’s flashing winner had found a line – and the Slovak bowed out when he netted a forehand on Wawrinka’s first match point. It preserved Wawrinka’s record of never having lost in the first round of the Australian Open, although it was a close call. The Swiss will face American Steve Johnson next. ‘For sure it’s a big relief, especially when you’re a break down in the fifth, 4-3, 40-15. So I’m really happy to get through,’ added US Open champion Wawrinka.